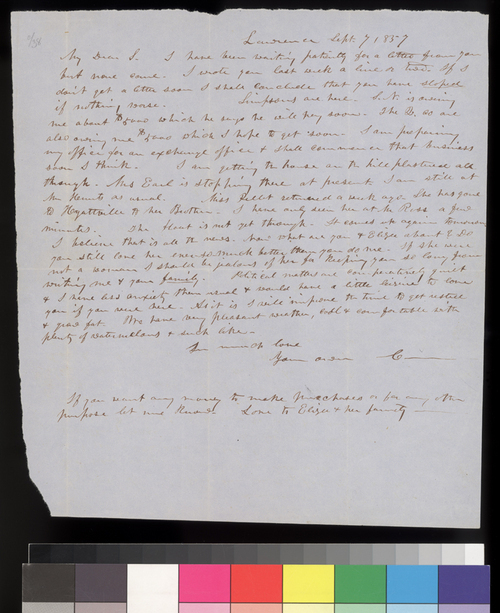 Charles Robinson, in Lawrence, Kansas Territory, writes this very personal letter to his wife, Sara Robinson, who was visiting family and friends back East. It briefly mentions the Quindaro land company business that was occupying some of Robinson's time and the fact that "political matters are comparatively quiet." Mainly, the "governor" just misses his wife and urges her to write soon and often.